Thousands of passengers faced travel chaos yesterday after rail service through the Channel Tunnel was suspended because of a power failure. The issue affected both Eurostar trains from London St Pancras and Eurotunnel, which operates freight and car services at Folkestone, Kent. Some passengers were stuck on trains while others had to wait in long queues at stations after the problem occurred at around 2pm. Services resumed shortly before 6.30pm. A Eurostar spokesman said: "Our trains are currently delayed because of overhead power supply problems in the Eurotunnel." Eurotunnel said: "Our passenger service is temporarily suspended due to a technical fault in the tunnel which is in the process of being resolved. "We sincerely apologise for the inconvenience this will cause to your journey." 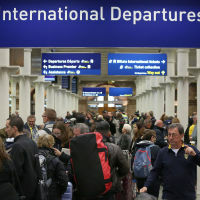 St Pancras became crowded and l ong queues of hundreds of people formed near the departure gates as rush-hour commuters and those booked on evening trains poured in. Gary Warburton, 57, and his wife Visha said they had been waiting since 1pm, when they checked in for the cancelled 2.22pm Eurostar service. The Bromley couple had been hoping to travel on from Paris to Barcelona for their 22nd wedding anniversary. Mr Warburton, who is hoping see Manchester City play in a Champions League match at the Camp Nou stadium on Wednesday night, said: "They have cancelled our train and offered us the opportunity to rebook or get a refund. "The only way to do that is online and the website has been overpowered so people have had trouble trying to rebook." When the couple eventually got through they were unable to rebook for the same day. "We are not confident - we keep seeing staff returning to their positions and we would like to think all of a sudden it will all go back to how it should be." Ten police officers tried to maintain order as queuing passengers bunched when boarding started, with anger from some people at perceived queue-jumping. Commuter Michel Vives, 56, who had been waiting for an hour and a half to travel home to Paris, said he had not been given much information. He added: "It seems all the people are quiet - in France for example, everybody would be rushing around shouting, so it is quite surprising as a French guy." Passengers arriving for the 6.01pm service were being allowed to check in. Those who had tickets for earlier trains were being advised by Eurostar staff to queue and wait to see if they could claim any unfilled seats. Holidaymakers should take out travel insurance to protect journey delays and cancellations.